Eleven months ago, we announced Zotero Everywhere, a grant-funded initiative to extend Zotero far beyond the Firefox browser. Last week we took the wraps of our new site design, which allows users to edit and reorganize their libraries via the web. Today we’re thrilled to announce the immediate availability of beta versions of Zotero Everywhere software. Because the idea of Zotero Everywhere was to be, well, everywhere, there are several different components to this beta release that can be used independently or in conjunction with each other. 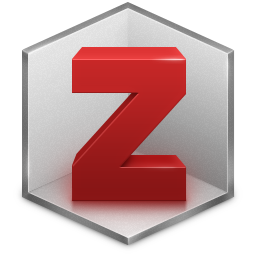 Zotero 3.0b1 for Mac, Windows, and Linux. Since 2006, Zotero has run as a pane (or more recently, as a tab) within the Firefox browser. Many users, however, have expressed their preference to run Zotero as an entire separate desktop application. As of today, researchers can now download and install a version of Zotero that runs fully independently of the Firefox browser. The user interface remains familiar enough so that long-time Zotero users won’t get lost, but this application also includes important new functionality, including automatic duplicate detection and resolution; an entirely new and streamlined integration with Microsoft Word and OpenOffice; and a refined quick search interface. 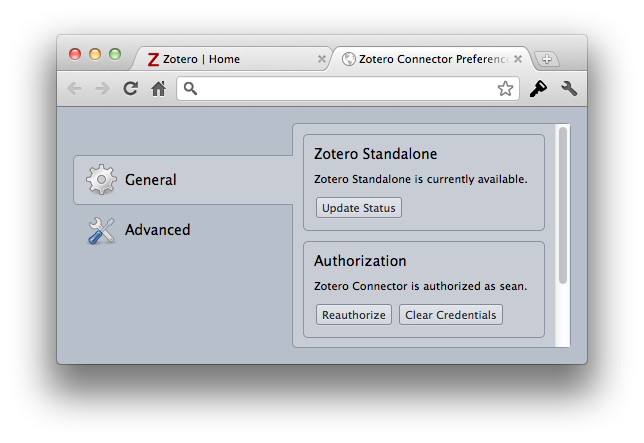 Zotero 3.0b1 for Firefox. The “classic” version of Zotero isn’t going away, and so we’re also bringing the same new functionality to the version of Zotero that runs inside the Firefox — except, of course, the ability to run outside the browser! Zotero Connector Betas. Today Zotero’s ability to grab bibliographic items with a single click now comes to browsers other than Firefox. If Zotero 3.0 is installed, Chrome and Safari users can now add items to their Zotero libraries with a single click. If Zotero isn’t installed on the user’s machine, the Zotero Connector can even add items directly to the user’s Zotero library hosted on our server (Please note that this entirely new direct-to-server functionality requires some rewriting of Zotero translators, a process currently underway. Amazon, arXiv, JSTOR, and the New York Times are among those already upgraded). Remember that Zotero 3.0b1 and the Connectors are beta software! If you’re in the middle of a project or not comfortable running beta software, use Zotero 2.1, the latest stable release of Zotero, instead. An entirely redesigned website including full read and write functionality. Based on our own public API, this site brings full interactivity with your library to any browser. A few design quirks remain, but we wanted to put all the new functionality into your hands now while we continue to iron out these issues in the background. 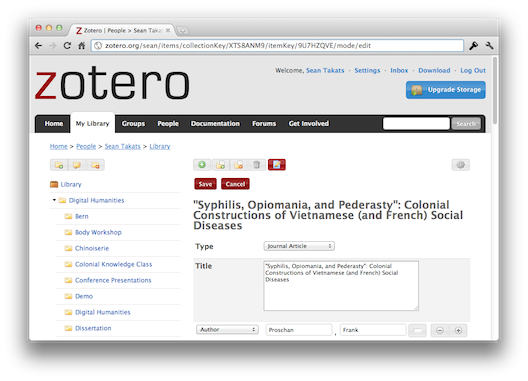 A beta release of the standalone version of Zotero. This new version of Zotero for Mac, Windows, and Linux no longer runs in a browser pane and does not require Firefox. New browser connector betas. Zotero’s ability to grab bibliographic items with a single click now comes to browsers other than Firefox. The initial beta includes connectors for Safari, Chrome, and Firefox. If Zotero isn’t installed on the user’s machine, the connectors can add items directly to the user’s Zotero library hosted on our servers. New word processor integration. A slick and streamlined new interface for adding and editing citations will be available in Word and OpenOffice. Much of this software will still remain in beta for a few more weeks, but we’re far beyond the initial alpha stage and well on our way to a production release. We hope you’ll agree it has been worth the wait! 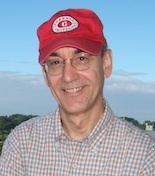 If you’ve ever used Zotero to create a citation, you’ve benefited from the talents of the indefatigable Frank Bennett, law professor at Nagoya University in Japan. Below is our spotlight interview with Frank, lead developer of the citation engine that powers Zotero’s citation and bibliography functionality. Frank Bennett, Associate Professor, Faculty of Law, Nagoya University. How long have you been using Zotero? Since December of 2008, so about two and a half years. What got you interested in developing for Zotero? Zotero was among the tools I reviewed during a trawl for software to recommend to postgraduate candidates, and it was immediately clear that this was one to run with. The system is a nearly perfect fit for our needs. Many of our students hail from countries in East and Central Asia, so open source design and community development were big attractions: there is not much point in training students on proprietary tools to which they may lose access after graduation. The architecture is also a good fit: Internet access from some countries in this region can be rather problematic, and that makes it particularly important to have a self-contained local image of the library on the user’s own PC. Zotero lacked a number of features needed for legal writing, and Asian language support (Chinese, Japanese, Korean) was not yet there. I have a tendency to tinker on things anyway, but those particular feature sets have been my main excuse for meddling in the project. What kind of development have you done so far for Zotero? The main things I’ve done are the CSL processor that Zotero 2.1 uses to format references (citeproc-js), and the multilingual branch of Zotero (MLZ), which several of us hope to see in production one day down the road. Both projects have been great experiences. Zotero development benefits from an amazing range of expertise among its contributors, and the core team’s insistence on standards-based solutions has a very positive ripple effect across the community. In addition to input from CSL designers Bruce D’Arcus and Rintze Zelle, citeproc-js has been kept in line by numerous commenters, ranging from members of the core team, through Zotero contributors and users, to developers working in entirely separate CSL-related projects. The feedback really has been invaluable. Early adoption of MLZ by Avram Lyon and Stephan de Spiegeleire’s team at The Hague Center for Strategic Studies moved the development goalposts much faster than would otherwise have been the case. There is plenty left to be done for multilingual, but it is largely thanks to Avram and others that the path forward is clearly in our sights. Anything cool planned for the future? I’m looking at producing a legal research and writing guide for Zotero, aimed at law students, to provide consistent guidelines for handling a variety of legal sources. With coordinated development of the main legal styles, it should tie in nicely with some important legal metadata initiatives underway within the free access to law communities of Europe and North America. It’s nice to see things falling into place, and I’m pretty confident that we will be able to offer improved legal referencing support in Zotero in the reasonably near future. You are currently browsing the Zotero weblog archives for August, 2011.